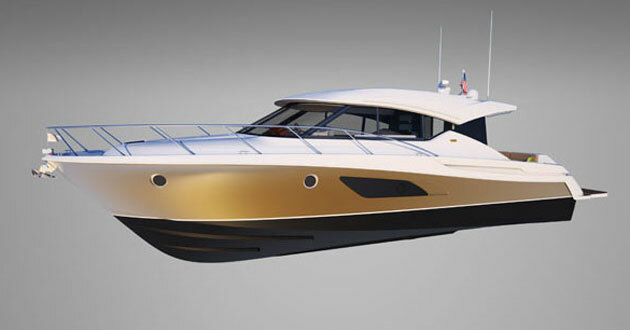 We’ve never before see a boat quite like the all-new Tiara Q 44 Adventure Yacht. Never. 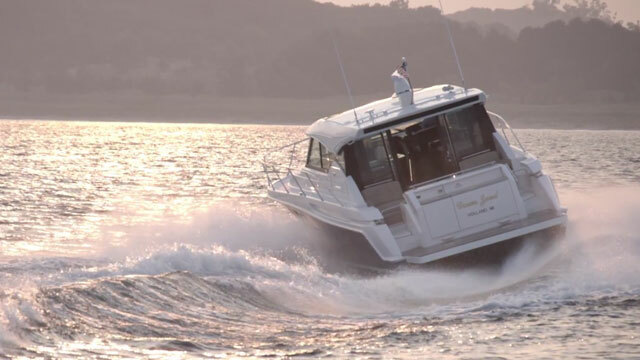 When Tiara introduced their new 50 Coupe two short years ago, followed quickly by the 44 Coupe and then the 50 Flybridge, it became apparent that the company was pushing in a new direction. These weren’t mere re-designs, they were all-new boats with different styling, the latest in power and control systems, and layouts never before seen in a Tiara. Now they’ve introduced the Q 44 Adventure Yacht—and made it clear that all the old notions of what a boat should be have gone right out the window. They’ve also made it quite clear that change is a good thing. At a glance, you can see the Q 44 is even more different from the traditional Tiara than those aforementioned new models. Is it an express? You could say yes, but you could also accurately call it a walkaround. Or a coupe. Or a cruiser. Or all of the above—it simply defies traditional definition. 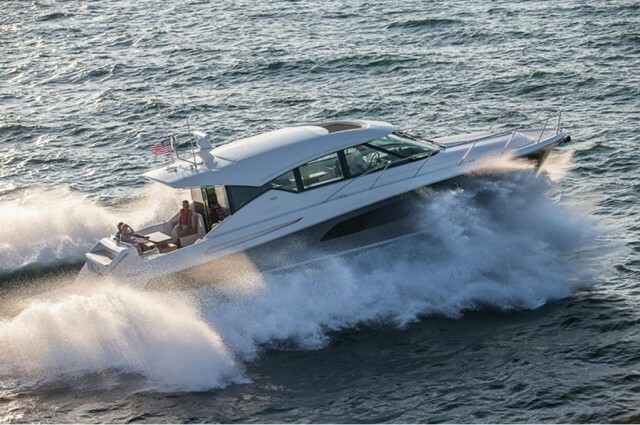 Whatever you want to call it, one thing about the Q 44 is clear: Tiara is trying to design a more versatile boat. By adding the walkaround dimension, designing a lounge into the front of the cabin-top, and placing sunpads up there as well, they’ve turned the bow into a far more useable area. By keeping the bowdeck, cockpit, and helmdeck on a single level, while also eliminating any aft bulkhead barrier from the cockpit to the helmdeck, Tiara keeps the distinct social zones more or less blended together. And placing an island galley aft means that whoever takes on cooking duty remains part of the conversations, in both the cockpit and the helmdeck. Both fore and aft, the Q 44 has a unique design. As you can see here, the helmdeck is open to the cockpit, and both are on the same level. The down-side to this design is a loss of overall interior cabin space. 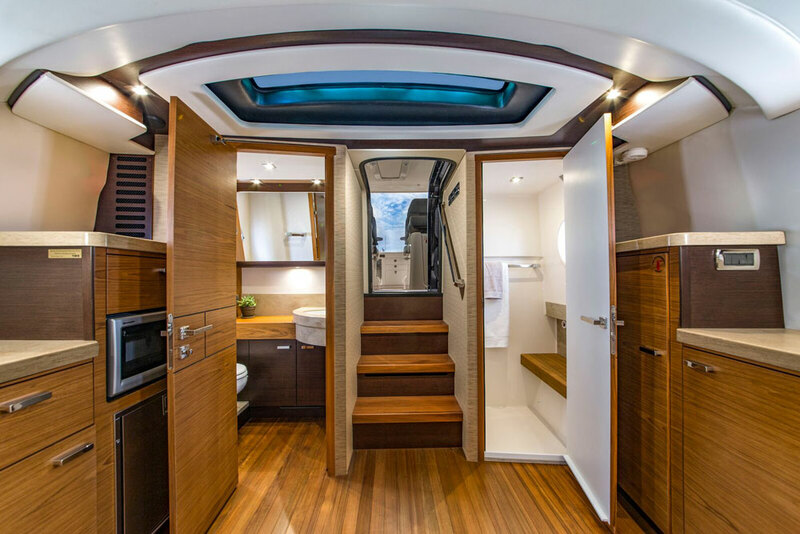 Sure, if the cabin top extended to the gunwales, space dedicated to the walkaround would add a good bit of elbow room belowdecks. But there’s still a substantial saloon with a scissor berth forward (it can be split to serve as seating or closed to form a berth), a partial galley with microwave and refrigerator, an entertainment center with a 29” flat-screen TV and stereo system, a fully enclosed head, and a split stall shower. So when you rattle off all the different types of boats the Q 44 Adventure Yacht could be called, add in “weekender” as well. The design may leave a bit less room for the interior, but it's nothing short of yacht-level inside. 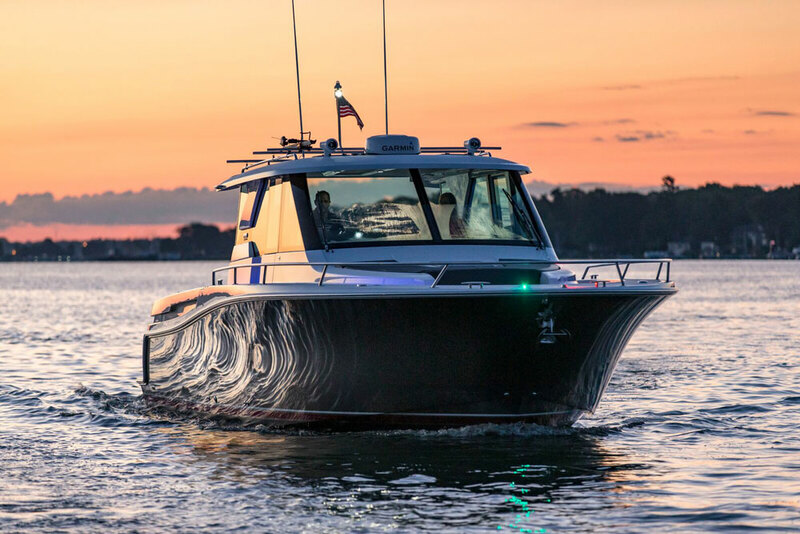 Can we call the Q 44 a “sportboat,” too? Well, not exactly. 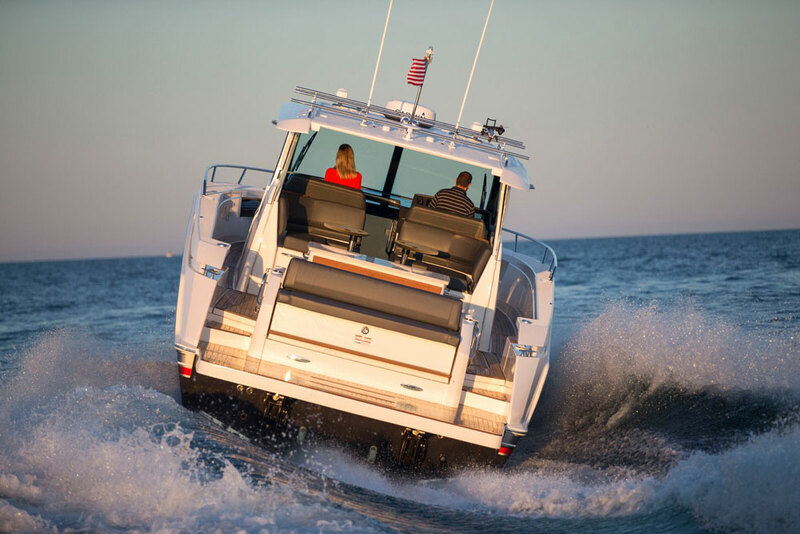 With a pair of twin Volvo Penta 435 HP IPS600s the Q 44 cruises in the upper 20’s to lower 30’s and tops out at just under 37 MPH. Those are respectable numbers, though not quite what speed freaks are after. That said, this hull and power package do have a handling edge over traditional boats. You probably already know that pod drives can out-maneuver straight shafts by a mile. (If you aren’t familiar with these propulsion systems, read All About Pod Drives: Volvo-Penta IPS, MerCruiser Cummins Zeus, and ZF Marine.) But Tiara takes it a step farther by including a Volvo/Garmin Glass Cockpit system on the boat, as standard equipment. This means you get full joystick control, both dockside and underway. One thing Tiara hasn’t changed much with this model is construction—and that’s a good thing. If you’ve ever run a Tiara through white caps and foam, you already know that they build a solid boat. Same goes for the Q 44. The hull is solid glass, hull sides and decks are balsa-cored, stringers are fiberglass-encapsulated wood and foam, and the bilges are lined and gel-coated. 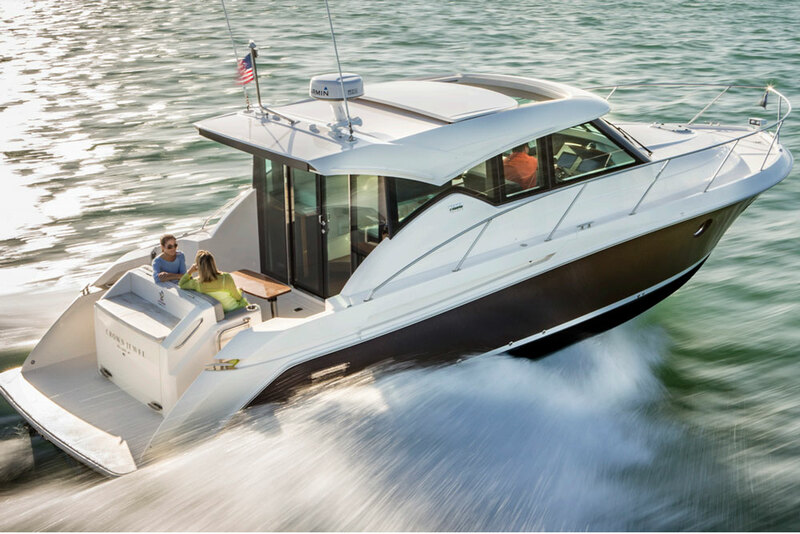 Check out the accessory equipment, and you’ll see high-quality brands from stem to stern: Bomar hatches; Lewmar windlass; Fusion stereos; Isotherm refrigerators and freezers; Lenco trim tabs. Naturally, quality doesn’t come cheap. The Q 44 Adventure Yacht starts at a hair under $800,000, and if you added all of the options (big-ticket items include a teak-inlaid hydraulic-lift swim platform for $58K, full teak decking for $40K, and a Makefast sunshade for $18K), you could push the price just over the million dollar mark. The word “unique” is vastly over-used, but it should be pretty clear by this point that in this case, it fits. And I’ll bet the concept won’t remain unique for long. Other builders are sure to pick up on it, and change the way they design their 40-something express/coupe/cruiser/walkarounds. And yes, in cases like this, change is a good thing. 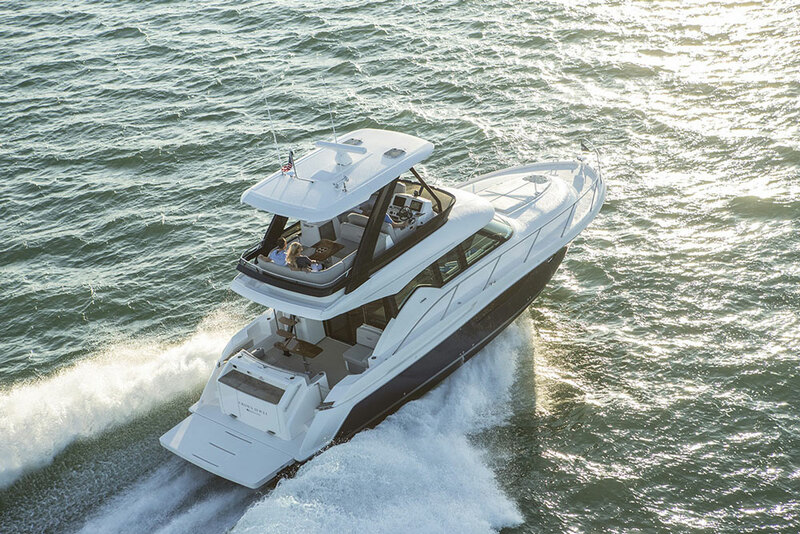 Other Choices: Some other unusual boats in this class include the Cruisers 45 Cantius (which places more emphasis on cabin space and less on the exterior), and the Hunt 44 Express Cruiser (which features a flush-deck walkaround). 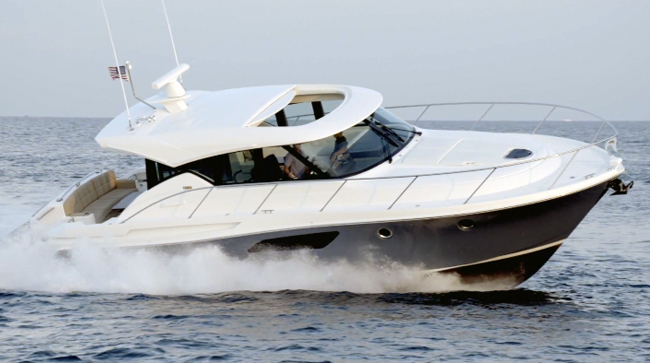 See listings for new Tiara Yachts. Test conditions: winds 5 knots, 2 POB. Performance data courtesy of Tiara Yachts. 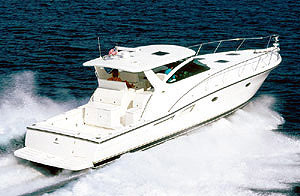 Power Twin 435 HP Volvo-Penta IPS 600 pod drives, swinging T3 stainless-steel propsets.